Luco Farms is a family owned business that has been growing award winning pedigree cereal and oilseed crops since 1937. Processing mustard grown on the farm is a natural transition focused on producing high-quality, fresh mustard products that are free from artificial colourings, preservatives and other non-value added ingredients. Our vision is to provide fresh, pure “farm to fork” products that professional and home chef’s can use to create new and interesting flavour profiles in their cooking. Mustard is an ancient crop that is being rediscovered. The Romans were probably the first to experiment with the preparation of mustard as a condiment. They mixed unfermented grape juice, known as "must", with ground mustard seeds to make "burning must", mustum ardens — hence "must ard". A recipe for mustard appears in Apicius, the anonymously compiled Roman cookbook from the late 4th or early 5th century; the recipe calls for a mixture of ground mustard, pepper, caraway, lovage, grilled coriander seeds, dill, celery, thyme, oregano, onion, honey, vinegar, fish sauce, and oil, and was intended as a glaze for spit-roasted boar. Although it is not common to roast boar on a spit today, mustard is recognized by the slow food movement and chefs for its value in building interesting flavor profiles in new dishes. 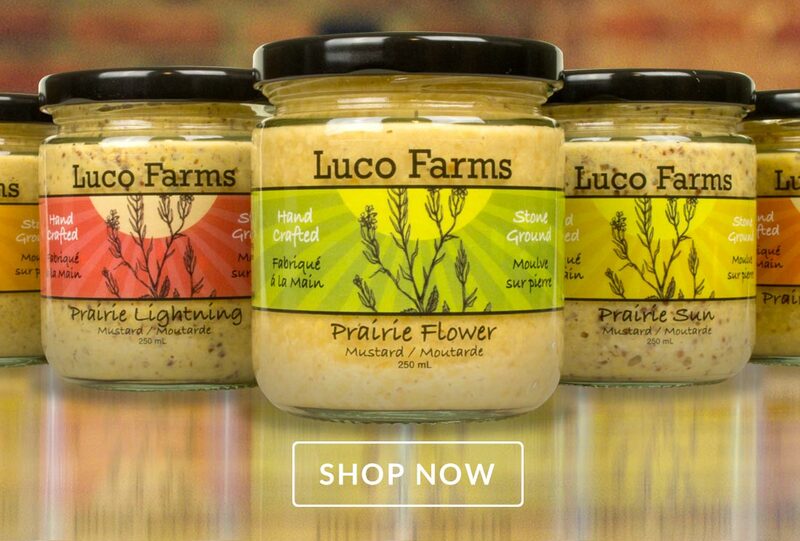 Luco Farms’ goal is to provide chefs and home cooks with hand-crafted, stone ground mustard products that are pure, fresh and free of additives and preservatives.